Phishing is the oldest and still a popular way of stealing login credentials. Most of the innocent users still fall in the Phishing attacks and lose access to their accounts. In Phishing attack, attacker sends a fake login page exactly similar to the original login page. Using that form for login sends the entered information to attacker. I already wrote an article describing the Phishing attack and methods to prevent this attack. Although, there are so many articles on Phishing but users still fall in this attack. 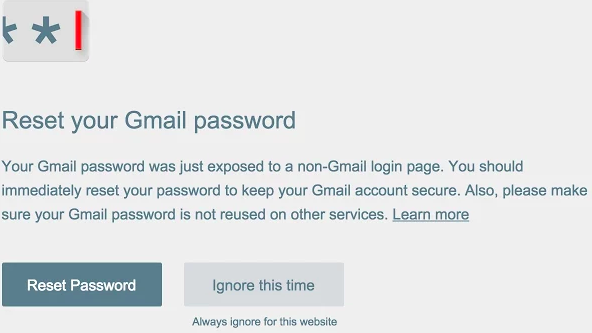 So, Google has released a Chrome extension “Password Alert” which notifies users about the phishing page. After installation, it will keep tracking your pages. If you enter your login details on pages other than Google’s own login pages, it will show notification and will suggest you to change the password. This is the extension release by Google itself. So, you do not need to take care about your password security. Google already confirmed that it does not save your password or send your data to any where. It only creates a thumbnail of your data to match against data you enter on pages. If it detects that you are entering your Google login information on pages other than accounts.google.com, it will notify you about the potential phishing attack.